What’s the price of a bike tour? Our regular public tours are € 25 per person, including guide and bike. 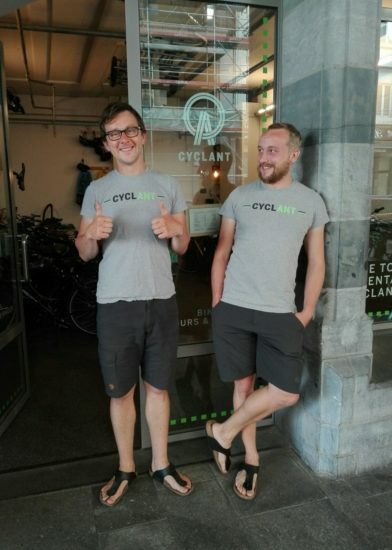 For private tours, you pay an hourly fee for the guide and a rental price per bike. When it rains, we put on raincoats and continue cycling with a smile. When the weather is really bad, the tour gets postponed. Our shop is in the Antwerp Central Station, just next to the main building. You’ll see a green flag next to the taxi stand. Google maps pinpoints us quite exactly. What kind of bikes do you have? There are 70 city bikes, 4 electric bikes, 2 cargo bike and 14 trekking bikes. Are there children’s bikes too? Yes, we have a kid’s bike (frame size 36 cm with 24″ wheels) suited for children around 11. Younger kids can jump in the cargo bike or in a kid’s seat on the adult’s bike. There’s a small bike for three year olds, but it isn’t suited for long trips. What is your business information? Our VAT number is BE0541348783 and our registered office is at Pelikaanstraat 3 – 1050, 2018 Antwerpen. HOLIDAYS ON A SUPER BIKE! For longer or shorter trips, our Santos trekking bikes are an excellent choice. Do you want to make a long day trip through Antwerp’s impressive port? 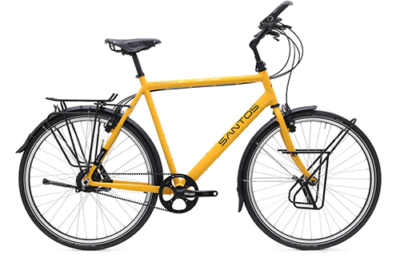 You are golden on this comfortable bike. Do you fancy discovering the rest of Flanders and/or the Netherlands on two wheels, look no further. Our top quality trekking bikes carry you ánd (if wanted) your luggage with ease all over the low countries. 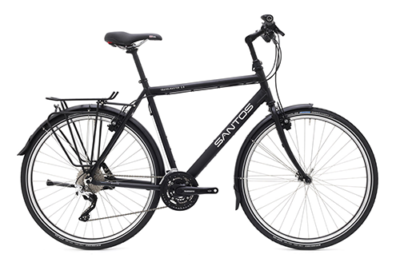 The Santos Travelmaster 2.8 is extremely reliable and very comfortable. The Rohloff 14 hub gear with belt gives you a wide range of possibilities and is virtually indestructible. The hydraulic Magura brakes provide security and with a comfy seat, steady POS lights and a lightweight aluminium frame, you set for a careless cycling holiday. And we have two bikes with electric support! Prices per bike, includes vat. Ortlieb handlebar bag included for free. We are Nicolas and Jona. We love our city and we love cycling. We think the bike is the best way to get around in the city and outside of it. 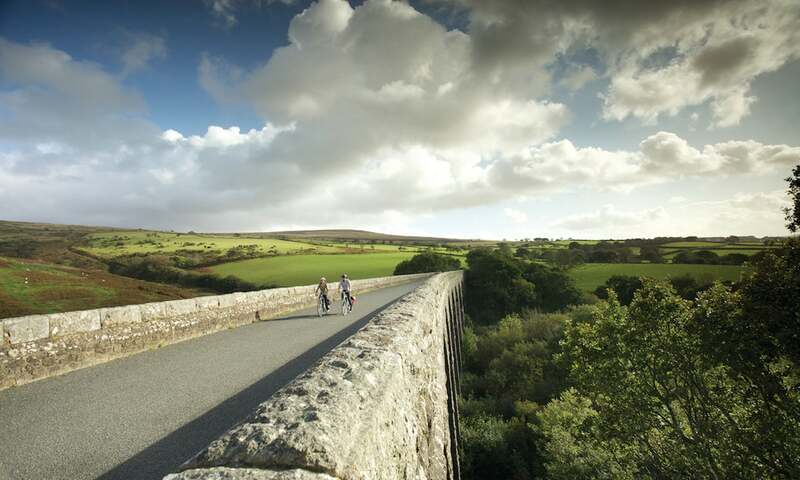 Travelling by bike gives you an unique perspective. 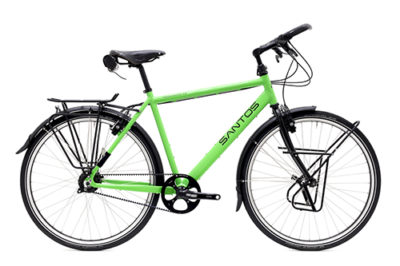 We believe in durability and that’s why we’ve chosen the Santos quality. Born in Antwerp and with a great deal of travels under our belt we’d love to give you ideas and advice. Feel welcome to drop by in our shop or the give us a call or send an email.